We are completely happy being away from the non-local politics and unprofessional bickering that TFN has become, we are growing and continuing to do what we set the original groups up to do: To Recycle. We’re not obsessive about our umbrella organization as we recognize we are local groups, the organization (scottishrecycle.org) helps in many ways, Local advertising, National focus, group identity, as well as advice and assistance from fellow G.O.’s. 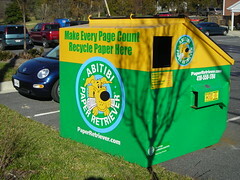 We wish all fellow Recycling groups (whatever they are called) the very best of luck in your endeavors. these scottish groups broke away a year away go and have been joined by other groups, regardless of the history or the reasons, the main point is the Recycling in the local areas.